I originally posted these pictures in March, but HECK...I wasn't even friends with some of you back in the day and wanted to show you my Acorn Collection! It IS fall after all! I feel like my house just comes alive during this time of year...and I become like a little kid excited for the upcoming holidays. The anticipation is WONDERFUL! These are my little place card holders I purchased at Nell Hill in Atchison, KS. What a wonderful store! My fall table setting, with yes....you see right....acorn and leaf confetti! My acorn pie crust attempt! 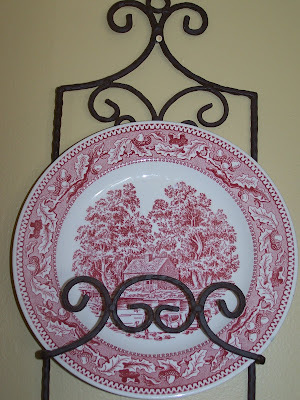 My red transfer ware plates, with you guessed it...ACORNS on the rim of the plate! Acorn cakelet pan from William Sonoma. So cool! Made them last fall and use edible gold dust to brush the tops. Everyone loved them! My Acorn teapot set that my sweet co-worker bought for me. He said it had my name written all over it! A little bit of my random acorn collection...ceramic, wood, felt, wrought iron...I'll take them in way, shape or form! This is the beautiful village Dan-the-Man stayed in on his recent business trip in Germany. The towns name is Windischeschenbach (Say that fast three times!) It's in the south east region of Germany(Bavaria) and looks pristine clean and breathtaking! Addendum 10/18: Dan the Man pointed out that the picture of the above town is Flossenburg, not Windischeschenbach where he was staying....heaven forbid you make a trip to Europe and I pointed you to the wrong town! Mercy! This is in Munich at Marion Platz...just some incredible architecture. Dan said you can't even begin to appreciate the detail carved in the stone at some of the buildings. Out of all the photographs, I fell I LOVE with this and am ready to build this in my backyard right now. Elves, fairies, chipmunks...whoever wants to reside there, this is just the cutest thing ever. The steps? C'mon! Absolutely magical! Do yourself a favor and click on this picture so you can enjoy the beautiful details inside this church, just breathtaking! Dan said there were trails and parks everywhere in the area where you just enjoy nature. Germans are big hikers and love to be outside, weather permitting of course! Beautiful buildings everywhere dressed up with bountiful flower boxes. I am all for it and love how charming it makes everything look. Lovely! There is more to share, I'll have to do a part two. We just got back from celebrating our anniversary early since Dan will be on yet another business trip on the real date, but at least this trip is much closer to home. We've just been enjoying each others company and had a lovely dinner. Hope everyone has a wonderful weekend! 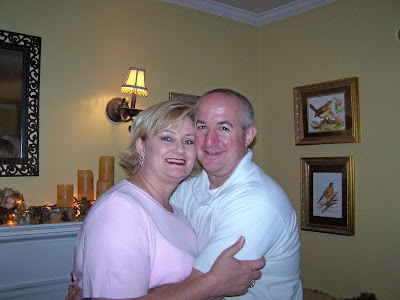 This is a picture of me and my sweetie Dan the Man. He has been in Germany on a business trip for three looooooonnnnnnnnggggggggg weeks. He is coming home this Sunday at o'late thirty and I can not wait to see him! We have been married for 9 years this month and I have been madly in love with him ever since we met. There have been many love letters exchanged, letters that took my breath away. When we were dating I would often get a love quote of the day that would make me swoon and walk on clouds. I saved every one of them. The day we got engaged was so memorable. He had a brought me the most beautiful long stemmed red roses I had ever seen, and we had a glass of champagne that evening. We went out to dinner at a wonderful Italian restaurant and had a great meal, then went down to the Plaza in Kansas City. For those of you who haven't been to Kansas City, the Plaza is a wonderful shopping area with beautiful architecture. It's sister city is Seville, Spain, so there are beautiful tile mosaics, and fountains everywhere. The whole area is lit up with twinkle lights in November and it's just magical. Dan arranged for us to take a horse drawn carriage ride underneath the stars and proposed to me while on the ride. After the ride we ran into a bar and shouted out "WE'RE ENGAGED" as I flashed my beautiful diamond ring, and the bartender popped open a bottle of bubbly and everyone around congratulated us as we had a toast. So, it is that man, that I anxiously await to come home. The last few days have been the worst...the anticipation of wanting him in my arms again, where he belongs! So thank you my friends for allowing me a little trip down memory lane. I am most fortunate that I keep having wonderful memories made and a love to last a lifetime! This is such a good and easy recipe to make in the fall. For people who don't care for yams with marshmallows melted on top, this is a nice little change, a little more sophisticated, with a delicious topping that everyone will love! Just click to enlarge. Enjoy!! !